BLACK METAL COMBAT PARACHUTIST QUALIFICATION BADGES Military Name Tapes & Rank Insignia. Leather Flight Badges for all Branches of Service. 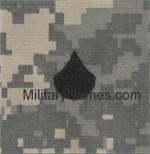 Black metal pin-on Parachutist qualification badges for the Army Combat Uniform.